I presented a lecture at the Pottery Workshop in Jingdezhen called “Exploring New Technologies,” on Friday, November 2. My talk focussed on my new research, introduced by a few images of earlier work. There was a large turnout and the talk was well-received, followed by some challenging questions from the audience. 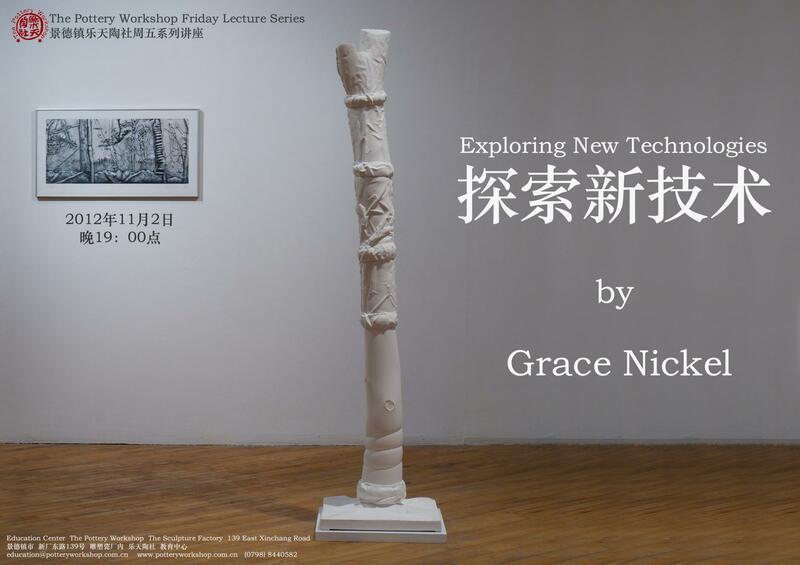 The Friday-Night Lecture Series is an initiative of the PWS that brings together the international resident artists, students from the Jingdezhen Ceramic Institute, foreign students studying here, and the Jingdezhen art community. I’ve extended my stay in Jingdezhen for an extra week to give my large work time to dry properly and be fired. Everything will be fired to 1300° C, yielding a beautiful, white translucence. Fingers crossed for success! Poster for Grace’s lecture at the Pottery Workshop, Jingdezhen.